So on the way to St. Louis, I stopped off at Earth Guild in Asheville and Angel Hair Yarn in Nashville, which I’ve already posted about. However, I didn’t post what I actually got at Angel Hair. This trip, I decided to go for locally dyed or spun yarns, things which wouldn’t be available back home. To that end, I picked up two skeins of sock yarn. 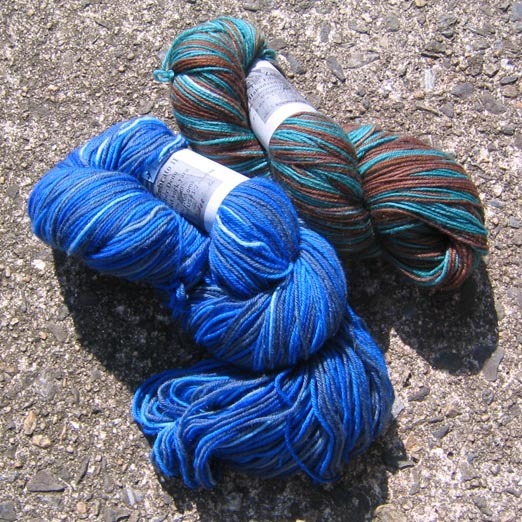 The blue is merino, the other is 75% wool, 25% nylon. It’s by The Fiber Denn. Their site is under construction, but they seem to have an etsy shop. They’re apparently local to Nashville, so that was good enough for me! Onward to St. Louis! 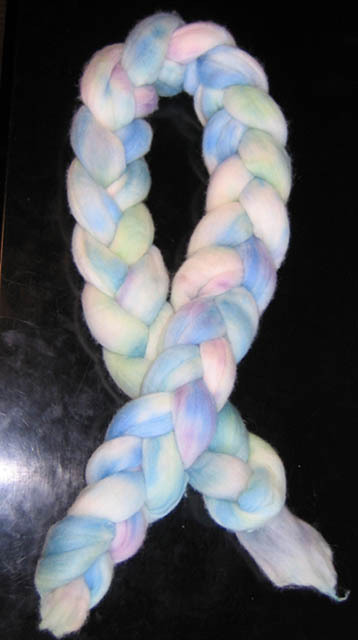 Through the community, I had heard that a manager of Knitorious also dyed roving. I definitely wanted to stop by, so Friday I followed what I thought was the map to their store, only to arrive at a residence clear on the other side of town. I had picked up the wrong directions. D’oh! Take two: Saturday. 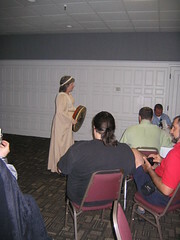 I wasn’t sure I’d go that day, since I really wanted to be at the GM roundtables at Simucon. I stayed at the seminar for a while, but there were so many people in the conference room all talking at once that the din was overwhelming. I had to concentrate and read lips to catch anything. Even then, I only caught about a third of what folks were saying, which made it hard to contribute in any substantial way. I finally realized that it was pointless and gave it up. There were plenty of other opportunities for players to snag their favorite GMs for less noisy conversation, so I don’t feel bad about it. Maybe next year we can try two separate rooms – one for DR, and one for GS and everybody else. Or maybe it’s just me, and I’m old. Heh. 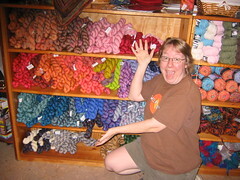 I arranged to be at Knitorious at the same time the manager was, and she sold me some roving. That’s two bits of hers on the left – the green and the red/yellow/blue. She also has an etsy shop. The red sock yarn is Claudia Handpainted. It’s not local, but it’s not something I can get in Charlotte, either. 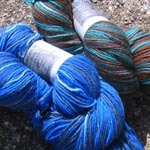 The blue is Dream In Color Yarn. I have no idea where they’re located, but this was just too pretty to pass up. Plus it’s machine washable, so, bonus! I finally had to make myself stop shopping and go back to the hotel. About an hour later, I checked my e-mail and learned that I had missed a Jayne hat kit client by about five minutes at the yarn store! ARGH! So near and yet so far! I should have kept shopping! Jayne girl was picking up more yellow to make a second hat. Her husband blogged about it – the hats look great! She seemed so nice, I’m sorry we didn’t get a chance to connect. I’ll have to post about the trip back another time. 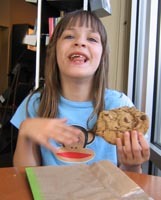 My daughter’s at camp at the local Nature Museum, and I have to pick her up soon. In the meantime, there’s scads of laundry, etc. to be done. That’s the price you pay for vacationing! Cleanliness is next to deathliness. [Tvini] Only one way to find out. [Adera] Heather has a sense of adventure at 10:30 in the morning! [New AGM] You’re right. To death and destruction! Or janitoring. My own mother found a link to Phii’s costume. Way to go, Mom! I ask you, isn’t that amazing? No wonder she took first place. I’m home again, by the way, after getting through only 32 of the 36 chapters of the Harry Potter audiobook. D’oh! Tonight, I am ready to sleep in my own bed, much smaller than the hotel beds, surrounded by the smell of the litterbox. 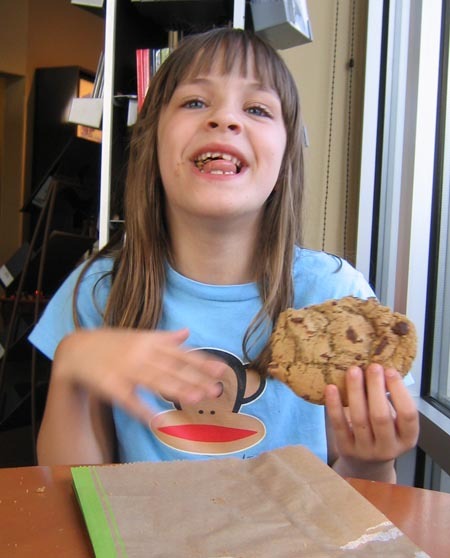 What makes it all worthwhile? 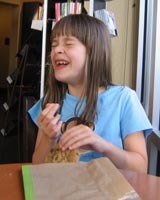 Here’s my daughter, who joined me at Starbucks tonight as we got a coffee for my wonderful husband, who had a no-caffeine headache after being on Emily duty all weekend. She’s explaining to me how anteaters use their long, sticky tongues to eat elephants. This is freaking hilarious – to both of us. It’s not you, they are all listing to the side a little. This happens to many people at Simucon in the evening. This guy wore his hat all night. How he didn’t pass out from the heat, I don’t know. Hey, Jayne hat guy four! Write me – I didn’t catch you on Sunday, I owe you a hat! I know I’m mangling that character name. This is a player standing for judgement in the costume contest. I didn’t get a picture of Phii’s phenomenal costume, but I’m sure it will be plastered all over the internet. The one pic I can’t believe I overlooked is one of Solomon, aka . Every time I saw him, he was in motion, being sure things ran smoothly. This guy was like a shark. Swim or die! His work paid off, everyone I saw was having a great time. He’s actually in this picture – barely. That’s the back of his head, the guy in the green shirt helping judge the contest. 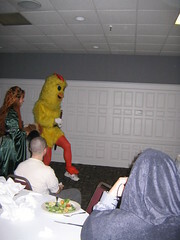 That Simucon standby, the Platinum chicken, was another entry in the costume contest. Show off those drumsticks, you saucy pullet! The player in this costume never spoke a word, but was still quite communicative. As we shared an elevator, I commiserated with him, sillently, since he nevers spoke, sharing my tale of how I once had to dress in a giant penguin costume. The old joke punchline, “What, and give up show biz?” springs to mind. This is DR player Tyrathia, whose Gemstone name eludes me. 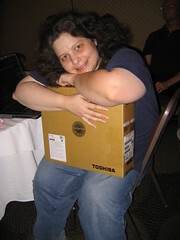 She’s gleefully clutching her new laptop, won in the raffle. The timing on this couldn’t have been better, since Tyrathia happened to have dropped her laptop a couple of hours earlier, taking a big chunk out of it. Tyrathia Need Laptop! Tyrathia maintains the fabulous DR/GS/AOH/Modus resource site, DRFuturePast. This is the woman who did my ankle henna tattoo, half of a mother/daughter team working on them. I brought the wheel out a couple of nights, and she decided to take a turn on it. Harder than it looks! 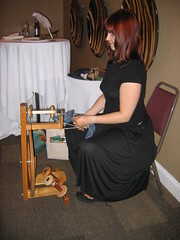 But she enjoyed it and kept at it, managing to spin up a couple of yards of yarn. Yay! 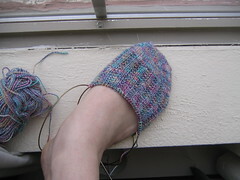 I had to have one non-Jayne project to work on while I was on the road, so I cast on for some socks out of Regia bamboo. This is the garter stitch rib from Charlene Schurch. The stitch is mindlessly easy, and the yarn is quite soft. I think that’s it for Simucon pics. Next time, the trip home! I would like to update tonight, but Holiday Inn Express’s internet access apparently has decided to continually slam me into another window after a random period of time. Le sigh. I did manage to get new pics onto flickr, but posting them here is iffy tonight. I’m in Crossville, TN, and had a great day. I’ll post about it another time. 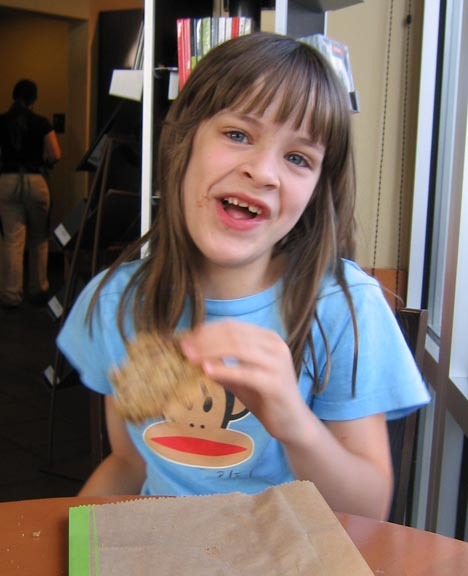 Tomorrow, back home – with maybe a stop at the Knoxville Zoo along the way. Whee! A Simucon attendee gets ready for a henna tattoo around her navel. Yes, all Dragonrealms players are this hot. I myself got two henna tattoos, one of a triangular design on my ankle and one of a ball of yarn pierced by two needles on my upper arm. Live to knit, knit to live! Woo! The second Jayne hat knitted over the weekend. 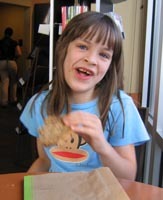 She’s so excited – I seldom to get to see people in person get their hats, and the response has been very gratifying. See above comment, r.e. hotness of Dragonrealms players. Side note, I stopped by Knitorious today for souvenir fiber, and apparently no sooner had I left than a Jayne hat kit customer came in, getting more yarn for more Jayne hats. The owner told her we’d just missed each other. 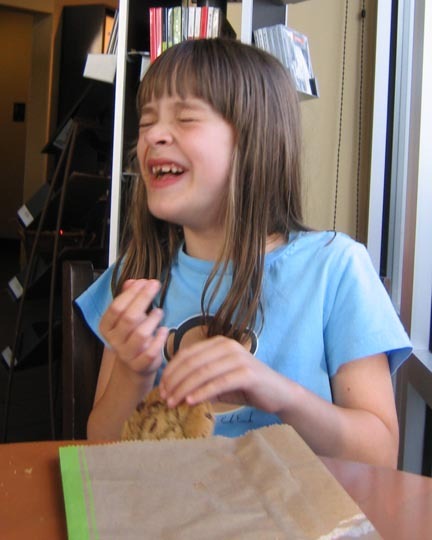 I believe her e-mail to me was titled “AAAAAAAAARRGGHHH!! !” but with more capital A’s. I can’t believe we missed each other either! I wish we had time to meet. Well, maybe next year. 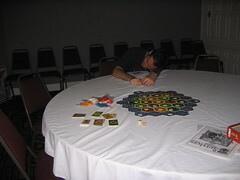 Settlers of Catan claims another victim in the Simucon game room. After a minute or two, this guy was out like a light. 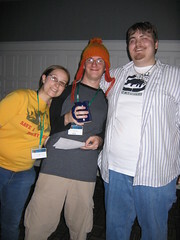 I can’t quite make out his lanyard color from the pic – he’s either a AOH player or possibly a GM. I’m thinking AOH player. I took this while playing… uh… something. It was a card game involving gangsters. It was fun, but I had to check out in the middle to go do something. I never did get to play Settlers, which was the game of choice at the ‘Con, along with Order of the Stick and Munchkin. Naturally, Simucon fave Curses was played too. For lo! The Tvini beheld the Koigu, and it was good. I did pick up a souvenir at Angel Hair Yarn in Nashville, but it wasn’t the Koigu. I’ll show it to you later. Also, I got a line on a yarn/spinning shop in Murfreesboro called the Knaughty Knitter that I may try to hit on the way back. Greetings from beautiful downtown Knoxville! I am on the road to Simucon 2007. I got a late start from Charlotte today because I wanted to send out one final Jayne hat (actually two together, but you get the gist) and because I realized at the last minute that while I did have a dress to wear to the keynote on Saturday night that fit me, my black shoes were like little vises on my feet. I had to go shoe shopping, and I figured it would be easier to do in Charlotte than to find a mall in St. Louis. Although I do know where all the good malls are there. Also between here and there. I love road trips. Aaaanyway! A late start combined with rain in the Appalachians meant that my schedule was thrown off. 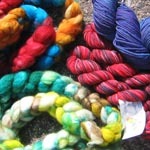 I was going to stop by Earth Guild and Yarn Paradise in Asheville. Both closed at 6pm. I walked into Earth Guild at five minutes to six and the woman behind the counter nearly threw me out, but who can blame her? However, when I told her I just needed a bobbin for my Louet (true, although with more time I would have liked to browse) she was very kind about letting me stay. They didn’t have one, but I did pick up a drop spindle. Then we chatted nicely about types of wheels, a subject about which she apparently has very strong opinions. Fortunately we were in agreement on all points. Elitist shopclerk snobbery: it’s not just for comic book store nerds anymore. Getting there at six was nice, though, because I got to hear all the music that the Basilica of St. Lawrence played. It was charming. Maybe I’ll get to hit the stores on the way back home. I’m listening to Harry Potter and am up to chapter 6. That’s all I’ll say about that. Emily and her father and a friend of his and his daughter have all arrived at the beach, where they have all been having a wonderful time together. Tomorrow, I should arrive in Nashville just as the yarn stores attractions are opening. Then onward through Kentucky, Illinois, and into Missouri. Woo! 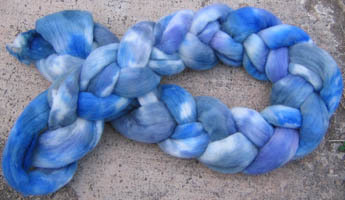 A couple of nights ago I dyed some wool, with an eye toward having it for my trip. I’m pleased with the results. This is the first one I did. It came out paler than I expected, but I still like the way it looks. I was going to for something with a lot of white, so it’s not jarring. I don’t have a scale, but the guys at the post office are always amazed that I can estimate the weight of my Jayne hat boxes to the tenth of an ounce, so I’m going to estimate this at right around four ounces. In the closeup, you can see some felting and fuzzing around the edges. I believe this is because I mashed it down in the water when I was soaking it, and because I pushed the dye around too much during cold-painting. 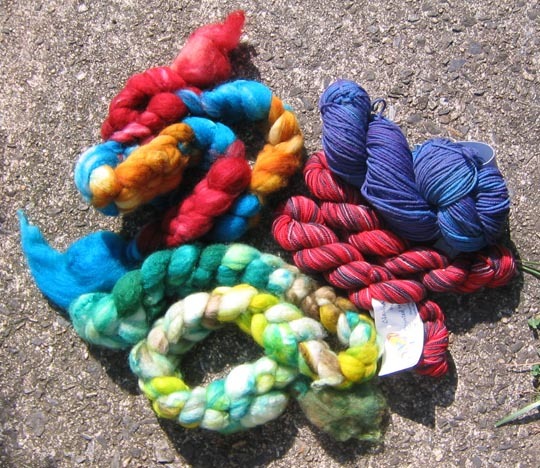 I set the dye with the “Saran-wrapped fiber sausage in a steamer on the stovetop” method. The next morning, I decided to use up the remainder of the dye I had already laced with vinegar. I added more dye to beef up the saturation and also more black to mute the colors a bit. As you can no doubt tell, I’m a big fan of blue. I wanted a variety of complementary tones within the same family, and again, I wanted some white showing. 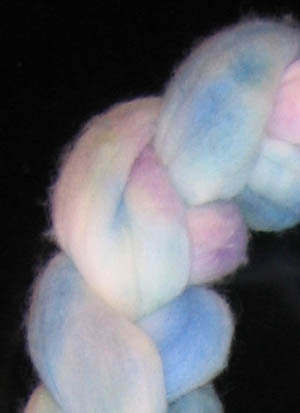 I think (hope) this’ll make an interesteing variegation in the final spun product. 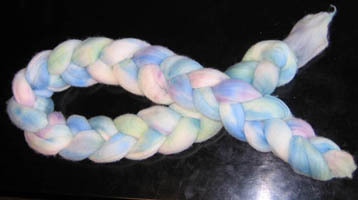 The blue wool isn’t as fuzzed and felted, since I learned from the previous day’s experience and handled it more gently. There’s still room for improvement in my handling procedures. Also, my daughter took the braids and put them over her head, Princess Leia-style, while she pranced around the house which didn’t do them any favors. 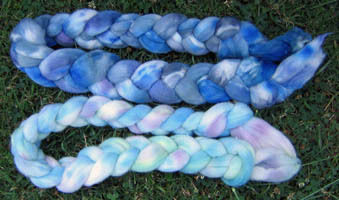 I’m really pleased with how these turned out for my first outing into dyeing unspun wool. I’ve got more white wool, so I’ve got more room to experiment. This was very satisfying, and I definitely want to do it again. I’m always open to criticism or comment – I like learning and feedback!